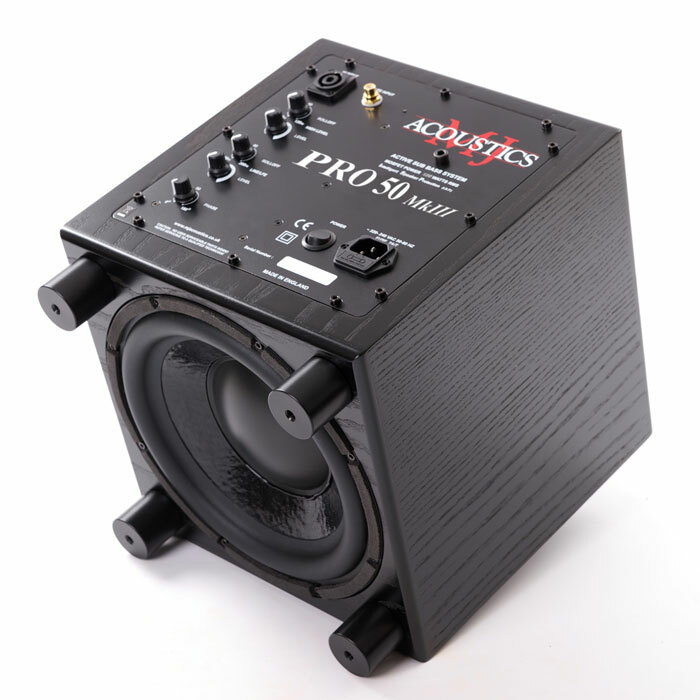 MJ Acoustics have always set the standards for affordable subwoofers since we released the Pro 50 in 2001. Redesigned from the ground up this Mk3 version subwoofer has it all. Twin Crossovers, 120watts of power, new designed 10” driver and all packed into a diminutive 280mm cube. capable of integrating with any speaker from small satellites to high-end floor standers. With bass output down to 13hz and a -3db rating at 19hz in-room it really is unbelievable value. The PRO 50 Mk3 is an audiophile addition to complement the most discerning cinema and music system! 120 watts of Class A/B MOSFET amplifier feeds an ultra long-throw super-rigid 10” sub-bass driver of rugged design and finish. Add to this a beautiful non-reflective satin finish, and attention to the finest and smallest detail. The PRO 50Mk3 delivers a smooth punch and solid slam – without the dreaded overhang – down to a gut-wrenching 13Hz. This is a true marvel with our unique combination of state-of-the-art electronics and tuned hand-built sealed cabinet, providing the ultimate in sub-bass control. Deep and powerful enough for the most demanding movie soundtrack, yet subtle, agile, fast, and accurate for the highest fidelity in music listening. It’s just like being there!